Yes, Queens finally got Edible this week, and it made me super excited! Why did it take so long? Queens is filled with great, ethnic food, 95% of it is cheap to boot, and yet we had to wait for Brooklyn and Manhattan's editions first. But it's here now! 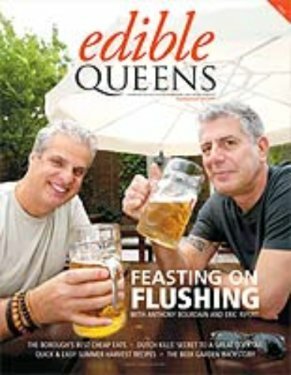 The first edition features a Flushing food adventure by Joe DiStefano, the official King of Queens Eats in my mind, with Eric Ripert and Anthony Bourdain; an in-depth story on the changing face of Queens County Farm; a look at the Mexican pastries typically eaten on the Day of the Dead; and a profile of Ali el Sayad, the Big King of Little Cairo (oh, my old 'nabe, how I miss you!) I absolutely can't wait to see what stories and secrets they're going to be publishing! And of course, we're now more than halfway to a fully Edible New York City. Read some of Edible Queens here. Or if you want your own copy, click here to see where you can pick one up. Most of the locations are in West and North Queens area, but if you're in Jamiaca or the Rockaways, you can find it at the Farmer's Market at 160th Street off Jamaica Ave.
i got myself a copy and as a Flushing resident, I say holla! What a lovely feature on this gastro neighborhood. Thanks for tha love blondie! Reppin 718 24-7 -- King Joey D.